It is a path for all kinds of walkers, that can be carried out in just over two hours, covering a distance of some 8 kilometres. The itinerary has signs showing the way that starts between the kilometre-stone 60,200 and 60,300 on the road C-710, approximately 10 minutes walk after Deià towards Llucalcari. The first metres of the track go via stone steps, leading into a tarmacked street that crosses a housing estate. The stone path is found again on the left, following the indications, rising gently between pines and olive trees. After the first metres of ascent a spectacular view is discovered overlooking the Deià and Llucalcari coast, and continues ascending until the group of Son Coll houses (C.XIII). Once past this point the path descends slightly until the fork that joins a few metres away with the Font de Son Coll or Ses Mentides. Returning to the Castelló path and once more ascending you cross a tarmacked area and continue up and down through a Spanish oak grove reaching the Can Prohom olive grove, the highest point of the excursion. Here you will notice particularly the threshing site called Pi de l'Ensaïmada referring to the round snail's shell shape of the Mallorcan ensaimada bun of the dried wall terracing it is on, and also the spectacular views over Soller. Immediately, starting the descent towards Soller, the Son Micó houses are found and the ruin Castelló chapel. The Castelló path joins this point with the Rost path and continues crossing small properties with olive trees. The stone path descends sharply in a zig-zag, goes over one of the Soller railway tunnels and ends at the Pla d'en Bieleta. 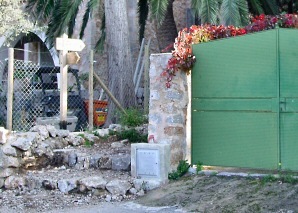 Shortly afterwards you reach the first houses on the outskirts of Soller, with orange groves, and the route ends at the C-711 road, a few metres from the petrol station.